Image via @mattjfriedman and passenger Frank Ferramosca. The landing gear on Southwest Airlines Flight 345 collapsed on Monday night just after the plane landed at LaGuardia, temporarily shutting down the airport. 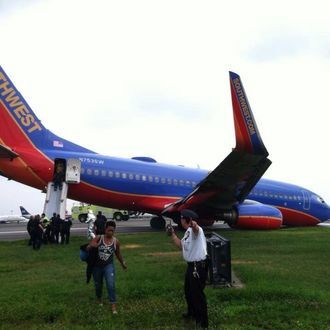 After a three-and-a-half-hour flight from Nashville International Airport, the plane was taxiing around 5:45 p.m. when the front wheel “popped off the aircraft’s landing gear,” according to Port Authority spokesperson Lisa MacSpadden. There were 150 people on board, including the crew, and at least ten people were injured. The Wall Street Journal reports that six people were taken to the hospital, four were treated at the scene for back and neck pain, and four other people suffered anxiety attacks. Update, 11:25 p.m.: NBC New York has footage of the plane skidding down the runway.